The intuitive software runs on a laptop computer under Windows 7 and features a simple user interface. 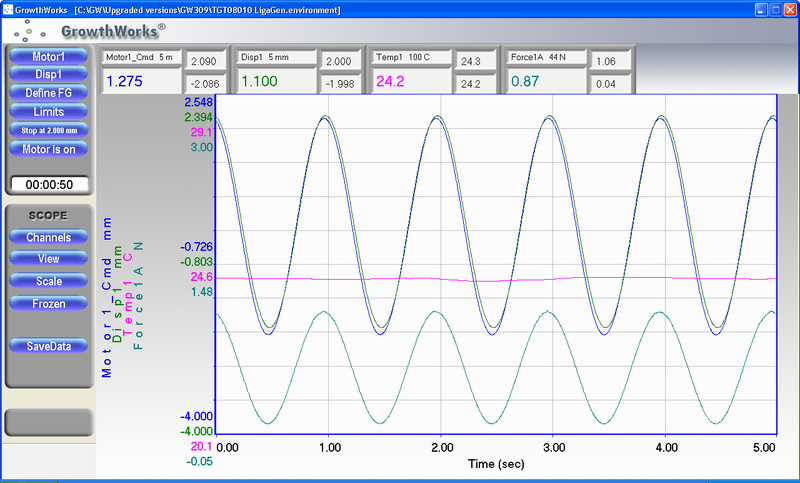 User defined stimulation profiles are controlled by the software and readily monitored using graphical displays. Integrated data acquisition routines capture and record data at user prescribed intervals. Featuring a 32 bit Intel® based CPU and integrated motor drives, the control hardware communicates with the laptop using a network cable. GrowthWorks can be configured to run four stimulators and simultaneously monitor up to 8 transducers, allowing the researcher to customize the system functionality. The controller can be customized with additional modules for applications requiring automation features or additional axes of mechanical stimulation. For applications requiring special control functions, the GrowthApps Modules are designed to run in conjunction with GrowthWorks. GrowthWorks takes care of running the bioreactor system and collecting the transducer data throughout the experiment while the GrowthApps modules provide additional analysis capabilities for overseeing a particular aspect of the experiment. The GrowthApps also have the ability to direct or adapt the stimulation profile that is being performed by GrowthWorks. For more information on the GrowthApps click here. Straightforward and adaptable, GrowthWorks provides the ideal control platform for mechanically stimulated tissue growth. Windows, Windows NT, Windows 2000, Windows XP and Windows 7 are registered trademarks of the Microsoft Corporation. Intel is a registered trademark of the Intel Corporation.